Casting -- one of the oldest known manufacturing techniques -- is a process in which liquid material (e.g. molten metal) is poured into a mold cavity and hardened. After removing the piece from the mold, various finishing treatments can be applied to create a dazzling final product. This process is used primarily to manufacture complex solid and hollow designs for a wide range of industries, from aerospace and automotive to electronics. Although casting is a tried-and-true relic of the manufacturing world, technological advances have created specialized casting varieties appropriate for different applications. Below we'll take a look at investment casting and die casting advantages and disadvantages so you'll be armed with the necessary information to choose which process is best suited for your upcoming metal project. Investment casting (also called "lost wax" or "precision" casting) is a manufacturing process in which a wax pattern is created, gated onto a sprue and repeatedly dipped into a liquid ceramic slurry. Once the ceramic material hardens, its internal geometry takes the shape of the casting. The wax is melted out, and molten metal is poured into the cavity where the wax pattern was. The metal solidifies within the ceramic mold, and then the metal casting is broken out (source). Die casting is a manufacturing process for producing metal parts by forcing molten metal under high pressure into a die cavity. These die or mold cavities are typically created with hardened tool steel that has been previously machined to the net shape of the die cast parts (source). 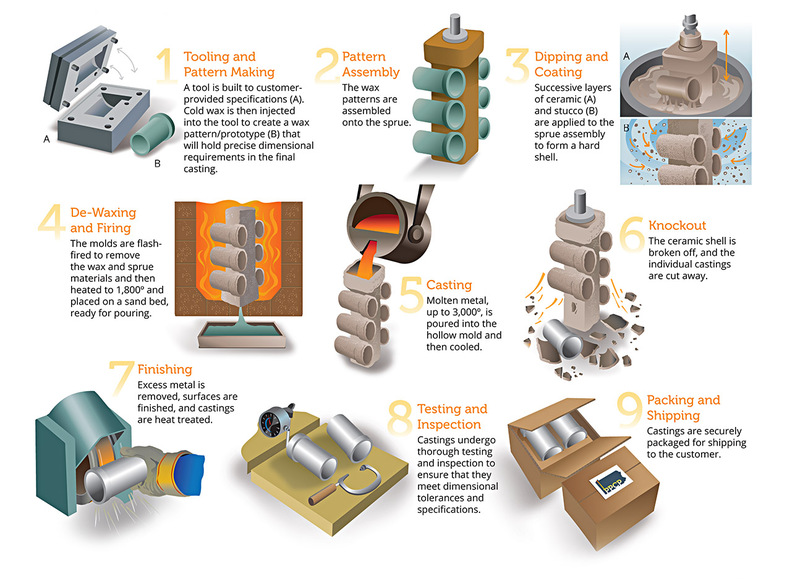 Here's an infographic by ESP International that shows each step of the high-pressure DC process. Click the image to view larger. Which Process is Right for My Project? Rather than pit these two processes against one another, we'll simply run through some key considerations when it comes to settling on a casting process. Keep in mind that there isn't a one-size-fits-all solution. Each product, project and company are different. 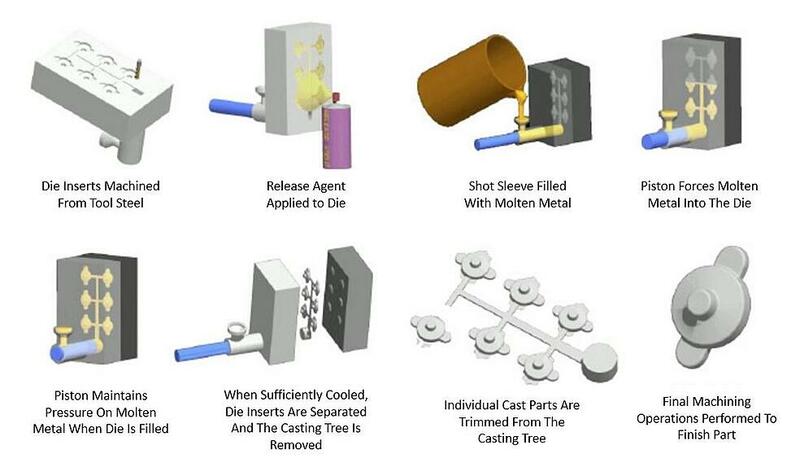 Review the 7 considerations below to decide whether investment casting (IC) or die casting (DC) fits the bill. How complex is your design geometry? This will play a major part in selecting the right process. IC offers great design flexibility since you can cast intricate shapes and easily incorporate design features, such as logos and other information, into the component. You can also achieve precise dimensional results, complex geometries and thin-walled parts. DC offers good dimensional results but cannot produce the level of intricacy that IC can. A wide range of alloys (including both ferrous and non-ferrous metals) can be used in IC, offering greater material options than DC. This allows for casting alloys that might be challenging to machine. Most DC are made from non-ferrous metals like zinc, copper, aluminium, magnesium, lead, pewter and tin-based alloys. One of the biggest misconceptions about IC is that it only makes sense for large order quantities. While you can opt for IC for smaller production runs, the final call usually comes down to tooling costs. Start by deciding your desired payback period for the tool and crunch some numbers to see if IC is actually the best option. DC is ideal for large production runs and high-volume projects since it produces excellent consistency and repeatability but comes with a higher tooling price tag. IC can accommodate parts from an ounce up to about 200 pounds. 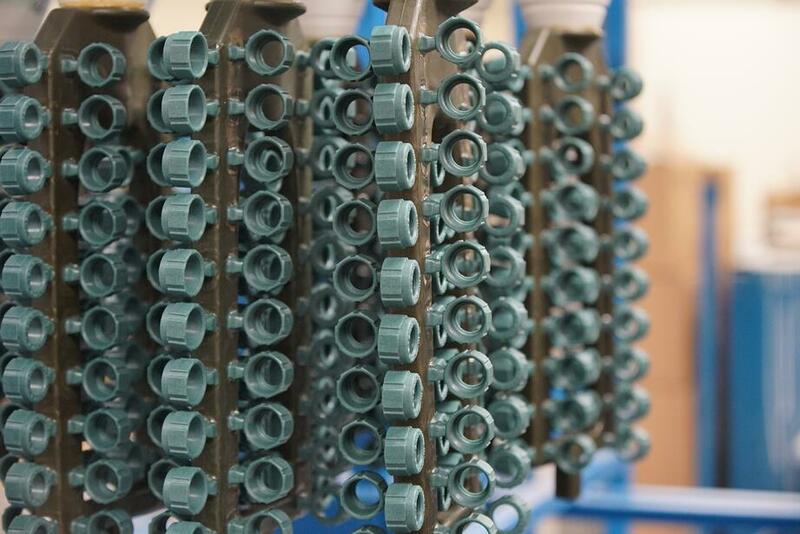 There is some limitation to the size of parts that can be investment cast simply because the wax pattern must be securely gated to a sprue for repeated dipping in the ceramic slurry. DC also comes with its own size limitations, but they tend to be less restrictive than IC; however, the larger the part, the larger the tool, the larger the tooling cost. IC can really deliver on tight tolerances, while DC produces good tolerances. As a general rule, the smaller the casting, the greater the dimensional accuracy. Very large investment castings might lose some dimensional accuracy, so DC could be a better option for large-scale pieces. IC ordinarily costs more than DC because it's a highly manual process that produces superior dimensionality and excellent surface finishes. But the final cost truly comes down to tooling. IC can be designed for minimal machining, reducing both time and cost. DC comes with higher tooling costs and typically requires at least some secondary machining to properly finish the product. For these reasons, DC is most cost-efficient for high-volume runs. The surface finish of IC is superior to other casting methods, reducing the need for excessive secondary machining. A 125 micro finish is standard, and better finishes can be achieved with the help of other finishing techniques like polishing or blasting. While DC produces good surface finish, more machining is usually needed to get the product to its final state. What Are the 5 Metals Best Made in India? « Manufacturing Location Considerations: Where to Make My Product?